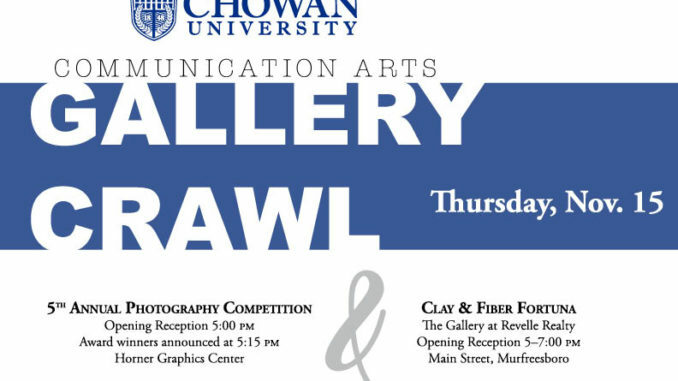 Come “crawl” with us on Thursday, November 15, beginning at 5:00 p.m. in the Krueger Gallery of Photography at the Horner Graphic Communications Building for the 5th Annual Chowan University Photography Competition Awards Presentation and Exhibition. Winners will be announced at 5:15 p.m. Then we will “crawl” over to The Gallery at Revelle Realty on Main Street in Murfreesboro for the Opening Reception of the Clay & Fiber Fortuna Exhibit featuring works from Dr. Mitchel Henke and Mrs. Jennifer Groves Newton. A group will be walking from Horner over to The Gallery on Main Street. The group will leave Horner at 5:35 p.m.